Last week my colleague Rebecca (Monitoring and Evaluation Officer for UNICEF Vanuatu) asked me if I could join her and our colleagues Bjorn and Asenaca from the Suva office for a workshop organised by UNICEF and Vanuatu National Statistics Office (VNSO). She said it would be handy if I could write up a press release for the local media. Seemed like a simple task so why not. Then she told me the subject of the workshop, which was “Data for Development: Workshop to Build Capacity in Statistical Literacy and Data Use to Support Child-Relevant Planning, Decision-Making and Advocacy”. Now it didn't sound simple any more and neither did it sound like fun. When I admitted that to Rebecca, she was shocked. Her response, “What are you talking about? Numbers are fun! And analysing numbers is even more fun.” That was clearly a nerd alert but according to her, I was going to see it in the same light after the two-day workshop targeted at government officials, civil society and other users of data on the situation of children and women in Vanuatu. I like numbers but in the context of math, where it is quite clear cut. Two and two is four - you can’t debate that. You can try but you will fail miserably. However, numbers for development aren’t that straight-forward. They can be consolidated and analysed in several different ways, and then they can be interpreted in many more ways! Data are more than just numbers. They reflect a reality of life. They paint a fairly accurate and objective picture of life. It is almost like the numbers are telling you a story. But having data is just half the battle. Being able to analyse the numbers properly and come up with rational conclusions and decisions is crucial. Without that, data are utterly useless! Just as you can hear a really good story but without actually understanding the moral of the story, you've missed half of the meaning. For UNICEF, consistent and credible data on the situation and well-being of children is critical to making the correct decisions on improving their lives. People like Rebecca, Bjorn and Asenaca are constantly looking for a “moral of the story” in numbers, to truly understand an issue and how to deal with it. They analyse data over time to understand where they currently stand and where they would ideally want to be in the future. Then they account for the realities on the ground – the strengths and weaknesses of a society and culture and assess what will work and what won’t. Finally, along with the government, they then come up with plans and policies to get to the desired end goal. Quite simply put, I now know the moral of the story but how am I going to effectively use the lesson I have just learnt? How am I going to improve lives with this piece of information? 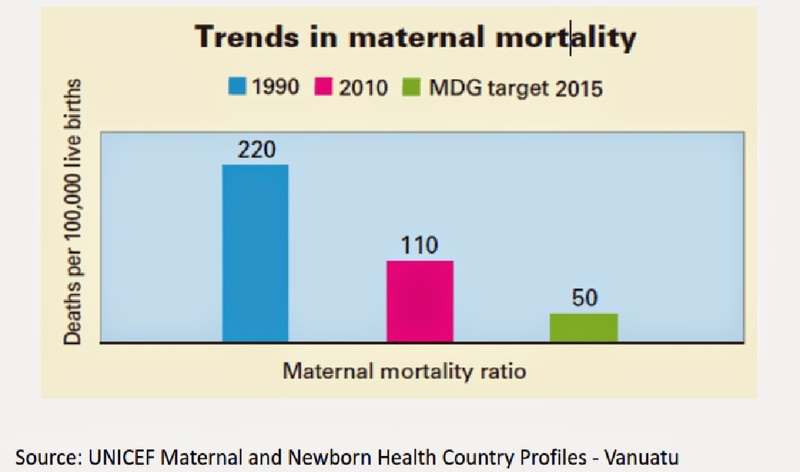 Let’s take this factual example of the number of women who die while giving birth in Vanuatu. To standardise this number and make it comparable internationally, it is number of deaths per 100,000 live births. The indicator has evidently been improving over the years and seems to be on track to make it to the UN Millennium target in 2015 of 50. But maternal mortality is the worst in this region. With the help of reports and surveys, detailed data behind these deaths reveals the reality on the ground. What is the most common cause of the deaths? How many of those deaths were preventable and what is being done to ensure they are prevented in the future? Is there a common thread – perhaps a time frame, region, age of the mother? And these questions are just the beginning. I spent the better half of my week understanding this issue. But why should data like these matter to people like you and me who have nothing to do with making or implementing policies? Well, to begin with, I can now use this information to measure the success or failure of the authorities who make grand promises before an election. Also, I can now tell you the pros and cons of giving birth to a child in Vanuatu. The importance of being an informed individual just cannot be emphasised enough! The moral of my story: Don’t knock it till you try it. Rebecca was right. Data is cool, even when they are not simple arithmetic. Perhaps more so because they are not simple. Thank you Neha for a great article. It was a very useful training for people in the sector. Being a 'numbers oriented' person like Rebecca and Bjorn, I agree wholeheartedly that knowing your data means you are able to make better decisions. Decisions that affect the lives of everyone and everything around you.